Your level of productivity has a lot to do with the environment in which you work. A well-organised, well-planned working space gives you room to think and is conducive to better, and greater, output. That much may seem obvious; but of course, what constitutes the optimal conditions for working varies hugely from person to person, depending on personal taste, the type of work they do and a whole host of other potential factors. One thing that many people seem to agree on, though, is that working from home is particularly hard in a lot of different ways. Motivating oneself without external pressure, spending long stretches of time with no direct interaction with colleagues and staying focused when there are myriad distractions on offer are just a few of the issues people come up against when their home doubles as an office. The solution – though also one of the greatest challenges – is to design a study that makes work as pleasant as it possibly can be. That means something different for everyone – here are just a few examples. 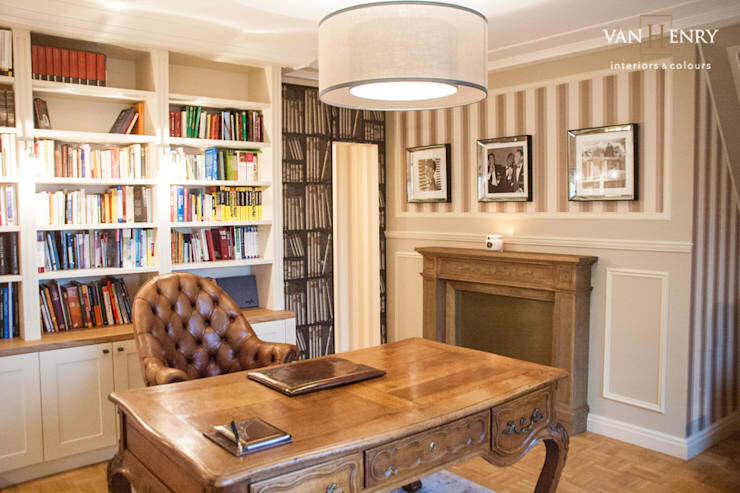 This simple room fulfils all the requirements of a study with minimal fuss. Bright and cheerful, it lets in plenty of light to keep spirits high throughout the working day. Crucially, there are no distractions in this room, with the pretty and unusual blind providing sufficient decorative flair to prevent things from feeling too bland. 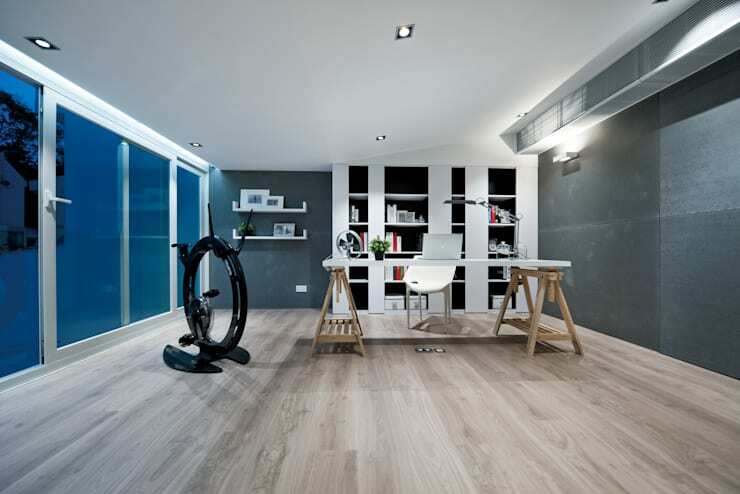 Although there’s a lot more floor space to work with here, the designer has chosen to concentrate the room’s furniture in one area, making the study feel very sparse and minimal. Again, this is a room that would be flooded with light during the day, thanks to its floor-to-ceiling windows anddoors. Including exercise equipment in your study is a good move, and one that can positively impact your productivity. It’s much healthier to take a break every few hours to stretch your limbs than it is to peer into a screen all day without pause. 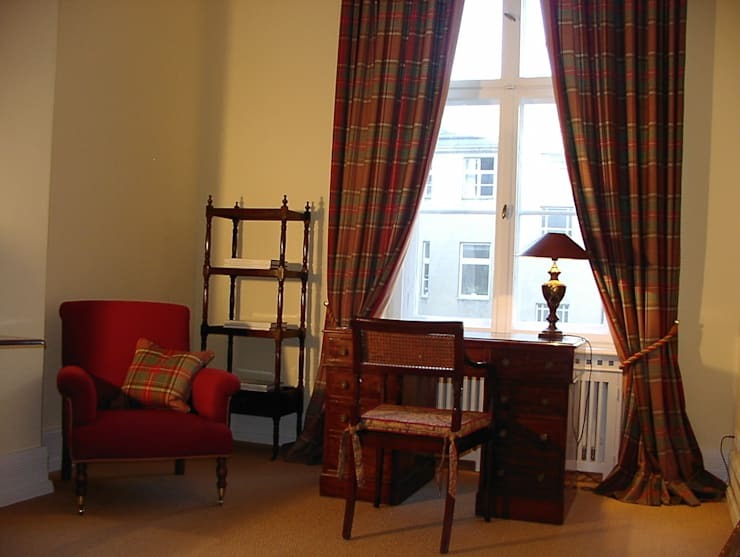 With tartan selected as the print of choice for this room and antique, dark wood furniture chosen to complement it, the space couldn't be more classic. Although the dark, strong colours do dominate the area, the white walls offset their effect so that the look isn’t too dated. It’s a good idea to have a comfy armchair such as this one in your study, so you can take a break to read a book whenever you feel like it without venturing to the living room and disrupting your work routine. This quirky space is all about geometry, with the unusual red barrier, triangular skylight and sloping ceiling all working together to cast unexpected shadows and create strange and striking shapes. This geometric theme is carried over to the workspace itself, with the angles of the shelf area mirroring the shapes seen elsewhere in the room. Matching the colour of the chair to the colour of the barrier also helps enhance the sense of design cohesion throughout the space. 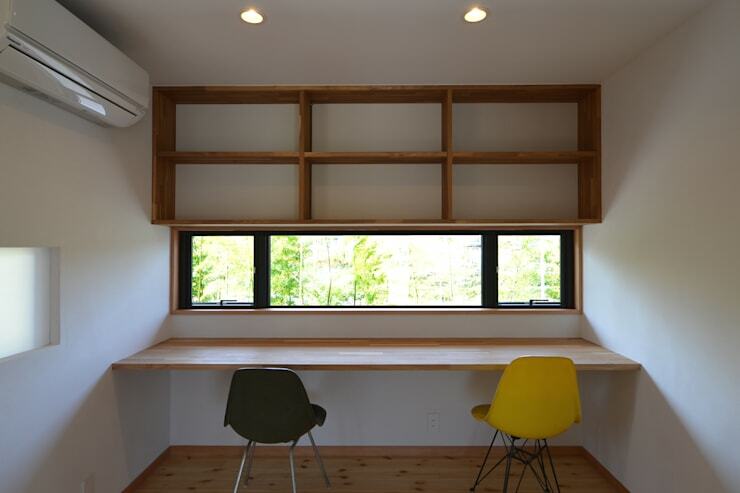 Utterly without frills, this room draws inspiration from the simple shapes and symmetry seen in traditional Japanese homes to create a workspace that’s functional and quietly beautiful. At the other end of the spectrum, the designer of this room has embraced contrast and complexity, with rich furnishings and clashing wallpaper all competing with each other for attention. 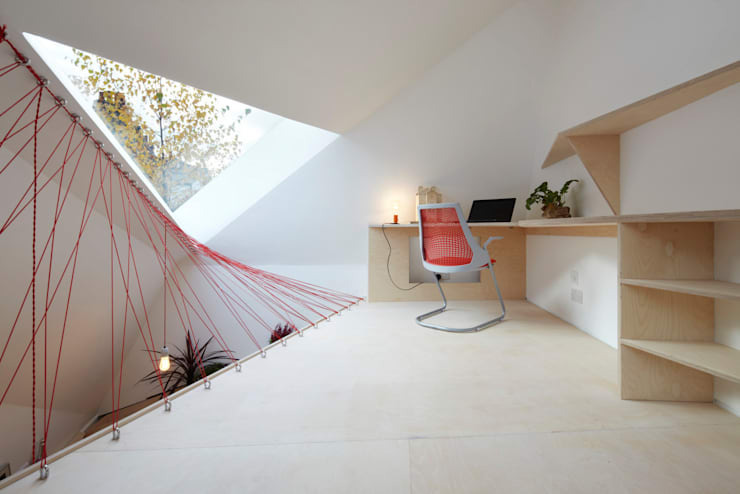 The result is a surprisingly soothing home office. Do you work from home? What does your office look like? Would you like to change it, and if so how?